The marriage of the smartphone and traditional photography continues as it appears as though camera companies have decided if you can’t beat em’ join em’. The latest proof of this is the recent release of the Olympus Air here in the U.S. After introducing this unique set-up in Japan only back in February, the company decided to bring this open platform camera to America. 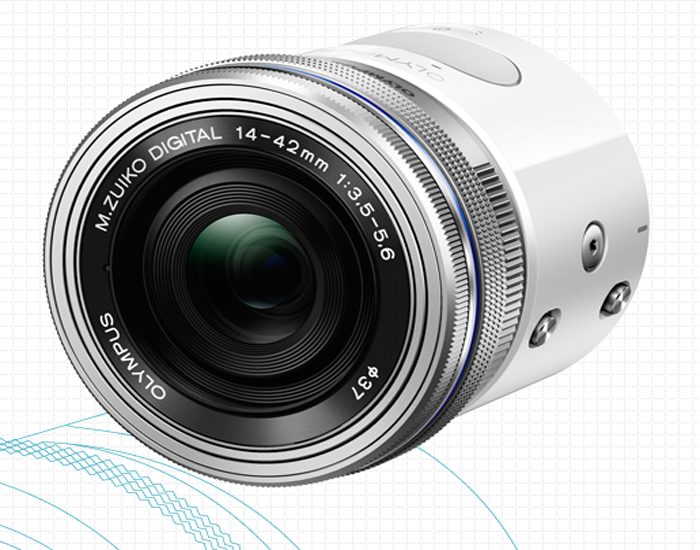 Ever since Sony introduced their unique QX-series camera concept a while back, the move toward the lens-camera for smartphone. has caught fire. After a nice run as the only camera manufacturer of a smartphone attachment camera, late last year Sony followed up on its original QX10 and QX100 with the new QX1. What Sony did here was do away with the integrated optics and simply let you mount any Sony E-mount mirrorless lens on to your phone (along with A-mount SLT lenses, using an adapter). And, far more important is the fact they did this successfully as the QX-series has done quite well on the sales side as well as being a critical success. So now the floodgates have swung open in pours Olympus with the aforementioned Air A01 – a Micro Four Thirds effort in this open platform space. This one features a 16MP sensor and can mount any M43 lens. The Air A01 mounts to the back of the smartphone via bayonet and actually is very similar to the Sony QX in design specs – with one key differentiator being it is even lighter and smaller than the Sony QX ( Air A01 is 57.1mm x 43.6mm – 5.2 ounces, the QX is 74mm x 53mm at 7.6oz). Another nice advantage we see in the Air A01 is the 45-degree pitched angle the smartphone screen is at once attached, allowing you to shoot at waist and chest level while you’re stuck at eye-level with the Sony set-up. These seem like minor things but once you hold the Air A01 in your hand these are the first two things you notice. 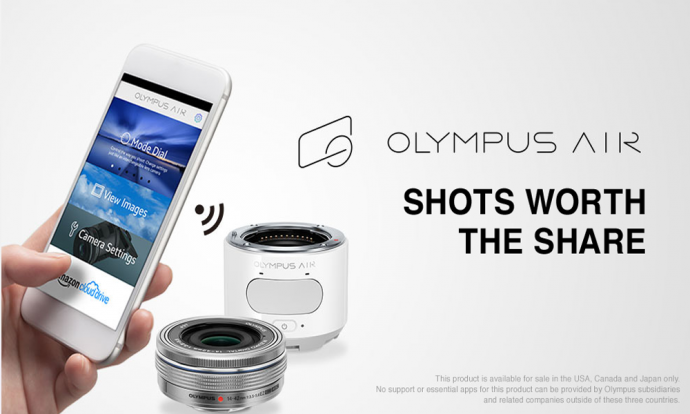 Olympus even factored in the hard charging phablet market as they included a switch that toggles the mount position between modes for smaller and larger smartphones. Very clever design spec. The Air A01 also features built-in Amazon Cloud Drive integration so you can directly access photos and videos that you’ve stored in your Cloud Drive account and do the always-vital photo back ups as you shoot. 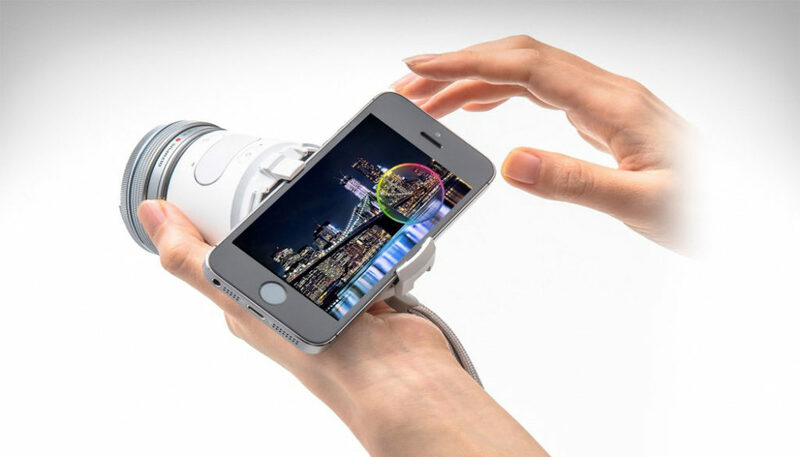 The camera uses MicroSD/SDHC cards and you can also wirelessly transfer your images to your phone. A full specs and features list is available here. There are eight dedicated Air shooting apps (it’s iOS/Android compatible) with the main one being dubbed OA.Central. At $299, we also like the fact Olympus priced this puppy affordably so shooters of all-levels and budgets can get in on the open platform fun this tech brings. However, as we opened this piece with, it’s clear camera manufacturers have decided to marry their imaging tech with smartphone makers in an effort to stop the bleeding. You just have to wonder at what point this “lens attachment” concept becomes a full-fledged camera concept – an advantage Apple and particularly Samsung will carry into the future as the two leading smartphone makers.